Channel delays: P&O Hull-Zeebrugge, sailing at later time of 23:00 this evening. The Rotterdam service leaves early at 19:45, latest check-in 19:00. Brittany Ferries Portsmouth-Santander leaving early tomorrow at 09:45. Weather alerts: Amber severe weather alerts for avalanche north Norway, high winds Baltic States and storms Italy and Adriatic region down to Greece. Weather: Cold, settled. Gales, heavy showers in the Mediterranean. Snow Eastern Europe and Greece. ITALY. Landslides caused by continuing heavy rain and storms have blocked local roads near Pescara on the central east coast. Two roads in the Sangro Valley near Chieti, about 10km south west of Pescara, have been blocked. Much of Italy has been under amber alert for heavy rain over the weekend, now concentrated in the south (see above). Meanwhile, around 1,500 residents have been evacuated from Pescara itself due to flooding. There have been two incidents now of drivers barely escaping flooded underpasses in Pescara. More Ecotaxe blockades planned today, particularly the A25 Lille-Dunkirk. Organisers from Spinelli Collectif National de Preservation du Transport Routiers Francais plan to block this road between the N41 and Rocade Nord Ouest (Bypass North West) north of Lille indefinitely if necessary, until the Ecotax system is cancelled. More actions planned around Paris and Marseilles. Updates as we have them. 17:00 GMT – A1 southbound now clear, as is the A55 at Marseilles. 15:40 GMT – the A25 protestors have stopped at the Ecotaxe gantry on the A1 southbound from Lille at Phalempin and, according to @laudecotte, set up camp. Traffic is backed up to Lille. Meanwhile, the blockade on the A55 at Chateauneuf les Martigues near Marseilles in both directions is still on-going. 14:20 GMT – definite signs of movement on the A25 southbound now. @laudecotte tweeted to say the convoy was moving off ‘en Escargot’ to Phalempin on the A1 south of Lille. Phew, so it doesn’t look like they’ll be there until Christmas then! 13:30 GMT – No change on the A25. 12:15 GMT – There is still a substantial queue on the A25 up to the bypass/N14 interchange. 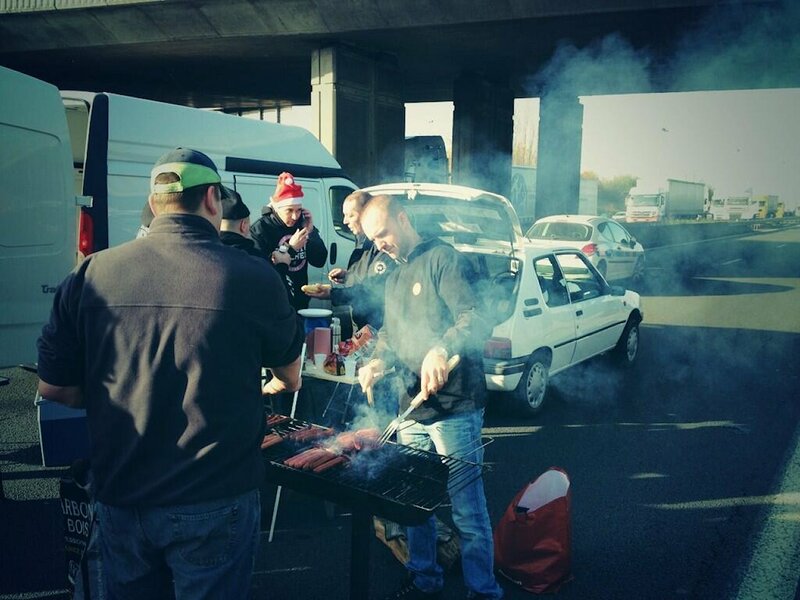 11:30 GMT – @laudecotte has just tweeted a picture of protestors firing up the barbeque on the A25 (above). 11:10 GMT – big queue southbound on A25 up to the Rocade Nord Ouest bypass/N41 interchange. Perhaps they are not quite ready to give up yet. Situation in Paris and Marseilles much improved. 10:35 GMT – A25 Lille-Dunkirk now fully reopened in both directions. 09:50 GMT – The blockade west of Paris – now easing – is caused by a separate demo about increased VAT on equestrian activities. The northbound A25 Lille-Dunkirk has now reopened from the north bypass (Rocade Nord Ouest). The southbound lanes are still closed. The situation on the A55 at Chateauneuf les Martigues near Marseilles in both directions is on-going. 08:45 GMT – There is still a blockade on the A55 at Chateauneuf les Martigues near Marseilles in both directions. The A25 is still closed between Lille and La Chapelle d’Armentieres in both directions though there are diversions in place. Major roads to the west of Paris are still very busy, plus the inbound A4 in the east. 08:30 GMT – Reports that the blockades have been called off around the country, or maybe just Paris. Police were well prepared and the turnout was poor. Will confirm. 08:00 GMT – Disappointing turnout for A25 blockade according to @laudecotte, a journalist with the convoy. Could be all over by lunchtime. 07:50 GMT – A25 northbound is closed from Lille to N41/Bypass North West (Rocade Nord Ouest) interchange. 07:15 GMT – the A25 southbound is closed from La Chapelle d’Armentieres to N41/Bypass North West interchange with diversion in place. 06:30 GMT – still no major disruption though journalist @laudecotte is onboard a convoy of fifteen trucks heading to Lille on the A1. 06:00 GMT – protest scheduled to start at 07:00 local time but no sign of much disruption on A25 so far though it’s definitely busy southbound. Drive me: 100 driverless Volvos take to the streets of Gothenburg in 2017 to mark the beginning of the end stage in autonomous vehicle development. 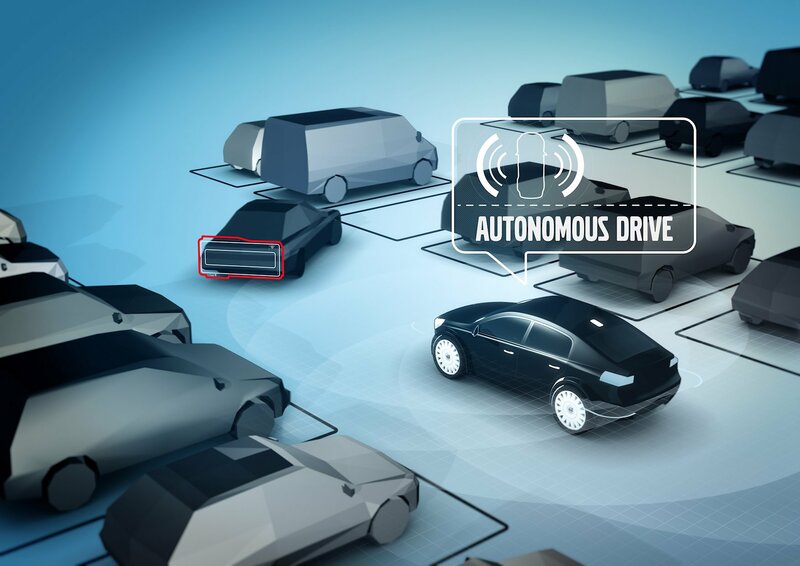 The project is endorsed by the Swedish government as the home grown hero seeks to maintain its edge in car safety and establish leadership in the increasingly competitive race to market self-driving cars. Google, Toyota and Mercedes are all trialling similar vehicles. Around 50km of roads around Gothenburg, including motorways and traffic blackspots, have been selected for the experiment. FRANCE. The Puymorens Tunnel in the Pyrenees – closed for safety upgrades since April 2013 – has reopened today for the Winter Season. The tunnel saves about 15 minutes for cars and 30mins for trucks over the mountain road and is a more reliable route on the N20 between Ax-les-Thermes and Puigcerda (Spain). Trucks and buses will alternate flows with waiting times posted at the entrance but cars are let through constantly. It closes again on 15 April 2014 for more work.